if someone should ask about the strangest rock concert of the season: it took place in the 'hoechster jahrhunderthalle'. 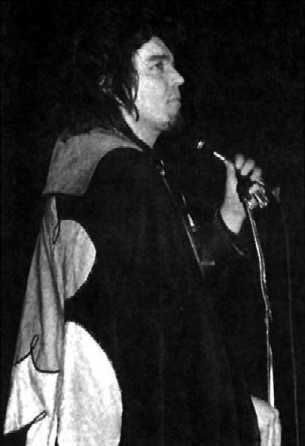 only a handful of insiders had found their way into the hall, and a kind of familiar atmosphere reigned as captain beefheart and his magic band started with their work. captain beefheart alias don van vliet (a zappa comrade from the land of the unlimited chances), on the outside a bear, a single copy with a voice of four-and-a-half octaves, makes rock theatre in an unusual way. his vocal cord acrobatics begin somewhere low down in the basement, roar impassioned from the stereo walls, practice as pneumatic crackling and shrieking drag - and finally end at circular saw pitch, a sort of torture rack for harmony loving ears, a thing like a synthesizer. the magic band works against the atonal, un-melodic anarchy of his voice: drums, two basses, two guitars that tear up rock devices in a wild mix - but skilled - and create an unheard tensile, polymetric music out of the remaining fragments. as solo players the musicians are accomplished: they know their manual between blues and free jazz. all in all: a total anti-music, a bombastic hubbub. the lyrics van vliet produces and recites (complete unintelligible - but you can't have it all) range - eye-blinking like the man himself - between mystic twaddle, much kitsch and beautiful nonsense. whether beefheart takes himself serious or not, it's funny anyway. thus - like zappa's mothers - his show creates a clear contrast to the maelstrom of the commercial pop music through irony and satire. much to detlef's and my regret the text over there is still IN GERMAN ONLY !